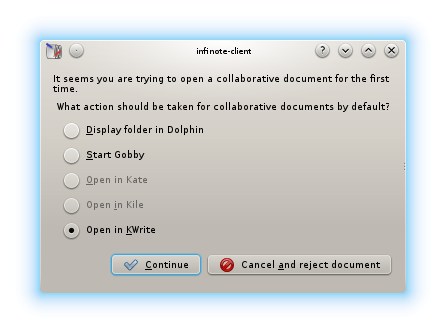 We have decided that kte-collaborative (the “Collaborative text editing in KTextEditor via kde-telepathy” project — see previous) is ready for a first release! This release is explicitly flagged as “preview” and might not be suitable for daily use just yet. There are still some known problems; the release is meant as an invitation to curious users to test the program and tell us about any problems they encounter. You might want to use the heads of the 0.5 and 0.1 git branches of libqinfinity and kte-collaborative instead to profit from the latest fixes made after the release tagging. The goal of this release is getting interested users to test the program, in order to get some feedback on what areas work well already, and what areas we need to concentrate on improving next. There are almost four weeks left of the time intended for working on GSoC projects — well enough to do all the polishing and bug fixing tasks which will surely come up. You can open documents from an existing infinote server and edit them, in at least kate, kwrite, kile, and KDevelop. You can browse documents in dolphin and also copy one or more documents to the server there. You can save any document to the server to have it shared in the same way. You can select Jabber contacts which have the program installed too and edit documents with them without any (network) setup required, except for having your Jabber account set up in Telepathy. This also works for Jabber chatrooms. Such a connection, once established, can be used to share an arbitrary amount of documents, simply by using Collaborative — Share document, and selecting the existing connection. Sharing a document with a contact will automatically ask that contact what to do, after he approved the request. The following issues are known and you don’t need to report them as bugs or wishes. Wide unicode characters are not supported. It’s an easy fix but I didn’t yet get around to do it. Gabble (the library dealing with Jabber in the background) sometimes hits some very high timeout values when establishing connections. This means that randomly, it might take several minutes to connect. This will have to be fixed in Gabble. In case the data is proxied over the jabber server (in-band bytestream), as it is currently frequently the case unless you’re using the program in a local network, there might be constraints on how many messages you’re allowed to send in a certain time interval. Unfortunately, against the recommendation in the in-band bytestream XEP, gabble will disconnect the bytestream when you hit that limit (instead of waiting a moment and trying again). Thus, typing quickly for a while can disconnect you and you’ll have to manually reconnect. There is no automatic reloading of folder views when files are added by other users. You’ll have to press F5 to reload the view. For the same reason, once a connection is established there are no notifications to a remote user that further documents have been added. Install kde-telepathy from your distribution’s repositories and configure your Jabber account, if you haven’t done so already. There’s usually a package called kde-telepathy-meta or similar. Run kbuildsycoca, and restart mission-control-5, telepathy-gabble, dbus, and kate (if running). The easier and more reliable way is to restart your computer. In any application using XMLGUI and katepart, e.g. kate or KDevelop, you should now have a “Collaborative” menu with various useful actions. There is no “Collaborative” menu. The KTextEditor plugin is not loaded. Go to Settings — Configure Editor — Extensions, and verify that “Collaborative text editing” is listed and checked. The “Share with contact” dialog lists none of my Jabber contacts. The application can determine in advance which of your contacts support the collaborative editing service, so we only list those which claim to support it. The dialog being empty means none of your contacts has the program installed — get someone to install it! The program crashes. That’s a bug. Please report it here. Potentially useful information to attach to bug reports: Full backtrace in case of crashes, debug output from the editor (enable all collaborative-related debug areas in kdebugdialog), relevant parts of the contents in the “Gabble” tab in ktp-debugger. First of all thanks for keeping us users posted about your work. And for greatly improving the experience of end-users of course. I'd recommend though, to add more context into questions in dialog boxes. If we take your screenshot for example, 5 options are presented but it is not possible to judge the effect of choosing a certain option. In addition to the program names, a sentence should be added that explains when an option is desirable. Personally, I've never heard of Gobby so I had no idea what happens when I opt for it. It would be great too, to explain where the default can be edited after closing the popup as it seems a global setting will be stored. Hmm, yes, that might be a good idea. The intention is that the user just selects the application he knows, or just clicks continue, and forgets about it. The option can easily be changed in the really tiny settings module we have, which is accessible from the menu. [ 102s] I: Program is using uninitialized variables. [ 102s] Note the difference between "is used" and "may be used"
Wow, the first one is a good find! That is really total nonsense code and might be related to crashes I have experienced there. Thanks! This sounds like missing packages. or similar, maybe without the -dev.